Room dividers can make a big difference in redefining the areas of any room, whether you live in a challenging studio apartment or in a home with an expansive open floor plan. After all, room dividers can help with styling and utilizing every space in your home. By using wall dividers to separate your kitchen and dining room for instance, you can create more intimate areas or use them to conceal certain aspects of a room. To make the most of room dividers, consider these brilliant room divider ideas culled from our Décor Aid decorators. One of the easiest ways to create a room separator in a large room is to arrange furniture back-to-back. And a tall bookshelf can also work as a divider for the areas in a room, this way, you’ll have a personal library that doubles as a room divider. Aside from a bookshelf, there are several other types of furniture that you can use as a divider, such as a console, desk, or table. You don’t need to spend a lot of money to create a partition wall for your home as sometimes all it takes is some ingenuity. There are scores of easy DIY room divider ideas that you can make yourself. If you’re trying to create an office space within your living room, create fabric covered boards as a divider. These boards will beautifully separate your home office from the rest of the areas in your living room. The sky’s the limit so be as creative as you want when creating a stylish and multifunctional room separator without spending too much money. Another DIY room divider wall idea that you can easily make yourself with rope is a graphic rope wall, specifically with thick jute ropes. You can easily find ropes at your local hardware store and they cost around $1 per linear foot, which is incredibly cheap. Rope walls ideal for homeowners who don’t want to spend a lot on wall dividers. Simply mount thin wooden beams on your ceiling and attached rope to the beams. While this DIY partition wall may not create a complete visual block, it should be enough to separate certain spaces in your home. If going the DIY route is not for you, consider buying readymade room dividers such as a folding solid or printed fabric divider. There are also movable fabric covered walls with different styles and designs so you can choose something that can work well paired with your home’s overall look. You can also choose to make your own movable fabric walls, using curtains or any fabric that catches your eye. If you prefer your partition wall to be something more permanent, consider building half walls for your home. The best thing about having a permanent wall is that you can choose to install windows in it or perhaps have an enclave where you can place some decorative items, such as picture frames, etc. With a half wall, you’ll have an open space with subtle dividers and decorative borders that will provide a separation for the various areas of your house. For temporary room divider ideas, a piece of furniture can do the trick. An elongated shelf can also be used to separate the living room from your kitchen. Even a TV console can be used to divide spaces. If you have a tall bookshelf, simply set it perpendicular to a wall in order to divide your home and add valuable storage spaces to your living areas. A bookshelf does not necessarily need to stretch towards the ceiling. However, for an added illusion and more storage space, opt for tall bookshelves as room dividers. This idea works best for those living in a studio apartment or small space and are not permitted to build a permanent wall. If you want to bring nature into your living space, why not use plants as room dividers? Potted plants offer a great alternative to furniture and permanent wall dividers. You can use a plant wall as a partition to divide large interior spaces into small sections. They offer flexibility and privacy without the need to spend a good amount of money on building solid permanent walls. There are various indoor plants that you can use as a room separator. You can also opt for synthetic plants for almost zero care and maintenance. Another way to save money on wall dividers is to use reclaimed wood. You can source various types of wood to create warm wooden room dividers to divide one large room into two. You can paint a wooden room divider any color that you like. Using rods is another stylish way to divide a room. In fact, steel rods are a stylish option when it comes to modern room dividers. With rods, there are various styles that you can choose from depending on the look that you are trying to achieve for your home. 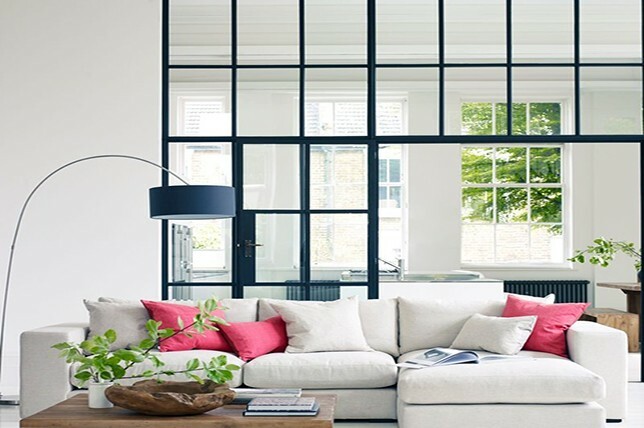 As mentioned, steel rods are great for modern rooms as they lend it a polished, visual punch. For rustic-themed houses, opt for dark wooden rods and if you want a minimalist look for your interior, white rods will work best. Remember that when it comes to room dividers, it’s important that you choose something that goes well with the overall style of your homes interior design. A caged wood room separator beautifully divide your living area and kitchen space. These movable walls would fit well into a space if there are several other wooden elements in the space or if you’re trying to create a rustic look for your home. You can also hang plants in the divider to make it look more organic. There are plenty of readymade caged wooden room dividers that you can purchase from furniture stores. You can also have one custom made. It may cost more, but it’s definitely worth it. Steel room dividers are ideal for modern and contemporary designed homes. They can also work for industrial style homes and apartments. Depending on the design, these room dividers can look grand and elegant especially if you opt for those that have metallic gold color. A gold colored steel room divider can harmonize well the sophisticated features of a modern contemporary home. A simple way to divide the rooms in your home is with a curtain. Chic curtains are a great way to reinvent spaces in your home without having to do a major renovation or makeover. Depending on the type of curtains that you use, you’d be surprised at how elegant it will make your home to look. The best thing about using curtains as room dividers is that it’s so easy to install and inexpensive.